It's been long that I sat down and reviewed something mostly because I was going through a phase that left me uninspired and also a bit demotivated too. Throw in a little summer and hectic university, and you get a perfect recipe for not writing. Anyway, that time is over and today I am writing about something that worked really well and I would love to share it with you guys! So let's go! 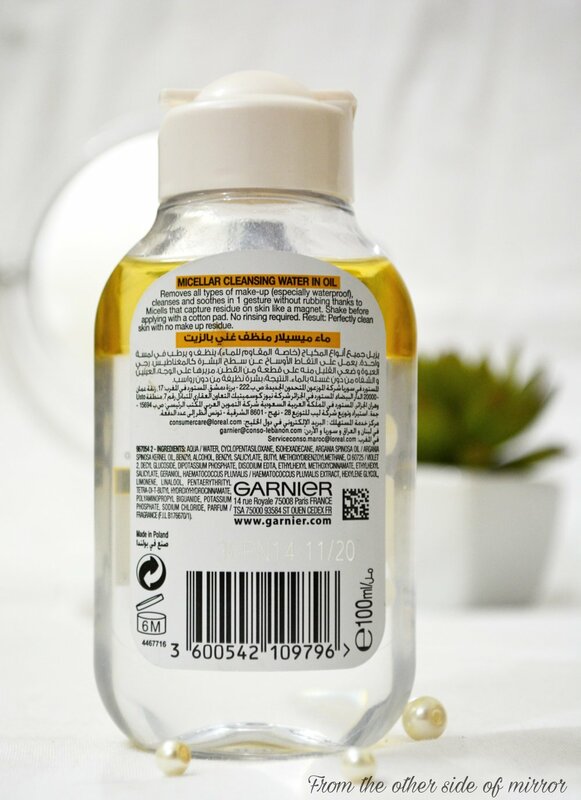 The Garnier Micellar Oil Infused Cleansing Water comes in a 100 ml travel size clear plastic bottle with a flip open cap just like the original pink one. Even though the size is quite adequate and would definitely fit your makeup bag, the flip open cap doesn't secure tightly enough and might open up accidentally if your bag is too cluttered. I would suggest securing it with a tape when travelling so there are less chances of spilling it. Now to the performance of the product which is the real point of all this. The product claims to cleanse and nourish the skin at the same time because of the Argan oil infused in it. I only take a few drops on a cotton pad and wipe all over my face even in daily routine. 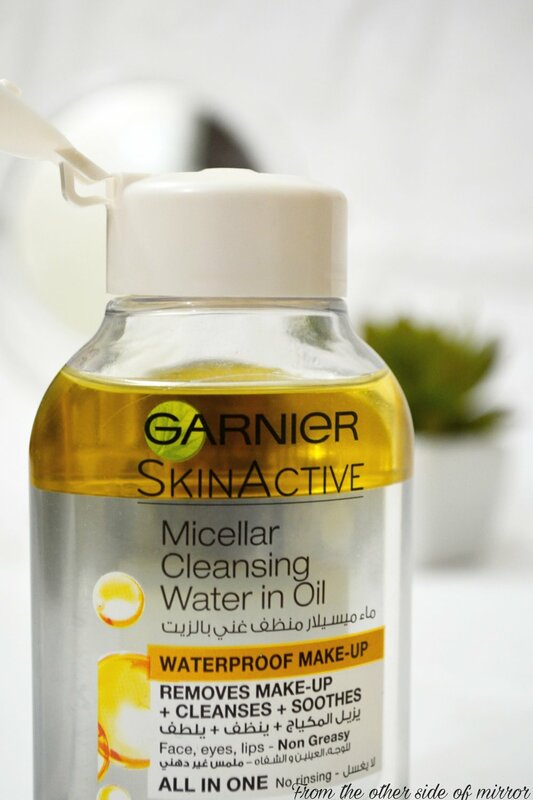 It leaves my skin soft and supple and doesn't make it greasy or tacky which most of the Miceller waters do to my skin. One of the main things that put me off the miceller waters is that it doesn't take off waterproof mascaras at all or if they do its a lot off rubbing and tugging that makes my already sparse lashes fall off. Since this one has oil infused in it already, it makes it really live up to the claims of taking off waterproof makeup, especially the mascaras. What I do is i take a few drops of the product on a cotton pad and hold it over my lashes for a few seconds and then gently wipe with it. It starts to take of waterproof mascara instantly and within a 2 or 3 swipes its all gone. This makes it a total winner for me and I love it even more than my Bioderma Sensibio (Read Review HERE). All in all, its one great product that cleanses and nourishes at the same time leaving your skin soft and supple without leaving any residue so you don't have to rinse your face after using it. 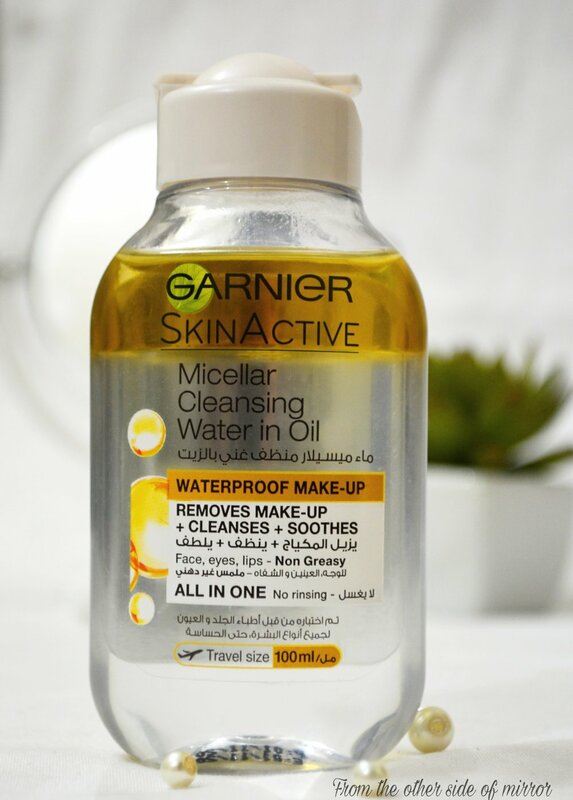 The oil in water properties make it a strong makeup remover that practically takes off all the makeup even your longlasting liquid lipsticks and waterproof mascaras. Also even though it has oil in it, it doesn't make you oily or greasy, so oily /Combination skin ladies can enjoy it equally. And cherry on the top is, it doesn't break me out at all. Definitely recommending this one as a perfect, or should I say better substitute to all the Miceller solutions out there!